It took me by surprise but yet it didn’t. After he was gone for a few hours, I knew it was not a good sign and I was right. After three days of confirmation from various men and women, it happened. Life was flipped upside down. Everything we had known for over 7 years was suddenly ripped away and we stood there, with heavy hearts waiting to see what was next. A new church, a new church family, new traditions, and lots of change. Our normal collapsed and I am not going to lie…there were days when I felt like my joy was gone. Joy is a lifestyle for me, just like worship is a lifestyle for me….joy goes beyond just being happy. Stability brings me joy. Stability brings me comfort. But all that was stable and safe for 7 years changed this year. But yet, I remain joyful. I rejoice in the unstable. So where does joy really come from? Basically, the Bible says this….even though all that was and is normal may fall apart….Rejoice! Even when the foundation of stability cracks….Rejoice! Even when death sneaks in and takes a loved one….Rejoice! Even when the checking account seems to be barren…..Rejoice! Even when physical pain slows down our plans….Rejoice! And especially when things are good….Rejoice! 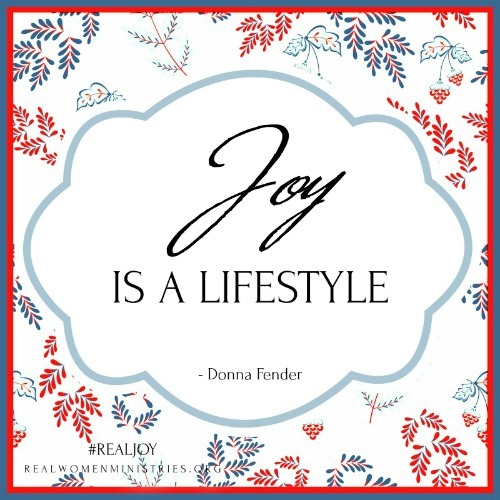 See, joy is a lifestyle because it has become my motto….Jesus first, Yourself last and Others in between. So, as our family looks to the future we are expectantly waiting to see what is to come. The “stuff” surrounding our past traditions will look a bit different, of that I am sure. But the joy that is in our hearts and spelled out on a sticker in the back window of my car, is very much the same. But don’t miss the last verse…it’s important. As the sure footed deer scaled the side of the mountain without slipping, so our faith in Jesus allows us to endure the hardships of life when things are no longer normal. Joy doesn’t mean an easy life or even a happy one….but it does keep us full so that when trials come, we don’t slip. So, as we walk through this thing called life…sing joy to the world! God has come and saved us all! Now that my friends is something to get really excited about! Lord, thank you for being the author and keeper of our joy. Lord, help us to rejoice when things are good and even when they are bad because ultimately You hold our joy and you have also defeated the one who can steal our joy. Lord, I pray for the women who have joined us in study of real joy and I ask that you will help us as we walk daily in this life that changes. Amen. 1) Read Romans 12:12. How can hope in Jesus help you to keep your joy? 2) Read Lamentations 3:31-33. How can we change our mindset when life collapses around us? Share with us a time where you were able to rejoice even when everything around you was falling apart. How were you able to see God moving in the situation.